Retour, deux mois après son malheureux décès à la suite d’un cancer à l’âge de 56 ans, sur la femme qui, bien involontairement (ce qui accroit d’autant plus la valeur de sa découverte), a probablement définitivement tué le mythe préféré des « birthers » ou tenants du « complot nativiste » (du moins les plus raisonnables d’entre eux), à savoir qu’Obama ne serait pas né aux Etats-Unis, ce qui, selon la loi électorale américaine, invaliderait son éligibilité et donc son élection. The latest news from the Obama Conspiracyverse is the first third-party proof of Obama’s birth in Hawaii. It’s a birth announcement from a 1961 issue of the Honolulu Advertiser that was dug up, ironically enough, by Lori Starfelt, who’s working on an anti-Obama documentary for pro-Clinton PUMAs. Although this announcement suggests his parents were married, that’s still an open question. Have you noticed that there are no photos of Obama as an infant? Barack Obama’s original birth certificate likely contains something that embarrasses him, or something that could be problematic for him legally, such as an indication of dual nationality. I STILL think he needs to produce a hard copy of the original Birth Certificate, or he looks like he’s hiding something. In the comments, TexasDarlin talks with fellow skeptics. Does this kill the Obama birth certificate myth? Dave Weigel at Reason doesn’t think that a key piece of information discovered by a pro-Clinton documentarian will kill the cottage industry of Barack Obama birth certificate truthers, but it will convince everyone else that this rumor has wasted far too much time already. 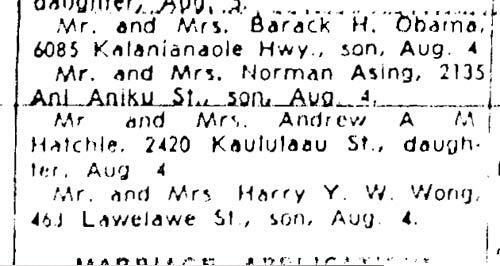 Lori Starfelt, a member of the PUMA movement in the Democratic Party opposed to Obama’s nomination, nevertheless found a birth announcement in an August 1961 edition of the Honolulu Advertiser — and guess who the paper congratulates for their new addition? The only issue for which a birth certificate is germane is the question of Obama’s eligibility for office as a native-born citizen. Obama’s campaign already released a copy of their Certificate of Live Birth which shows his eligibility, and the blurb in the Honolulu Advertiser confirms the data on the COLB. Obama has been confirmed as Constitutionally eligible for the office he seeks. Undoubtedly, this will not stop the speculation among conspiracy theorists. Taking a spin through the comments and the trackbacks at the site, one title actually says in part, “Mystery continues.” Unless someone wants to argue that the Advertiser decided to participate in a conspiracy at Obama’s birth in 1961 to provide false citizenship on the off-chance that an infant from a union of a Kenyan father and a teenage mother would run for President, then I’d say the “mystery” is over. I promise you that this piece has information not posted anywhere before. This work is exclusive to this blog. Material published elsewhere after the date of this article, should probably cite this work. This blog post is about the research I have done into the history, microfilms and stories connected to the newspaper birth announcements of obama’s birth. I realized quite some time ago that no one had done comparisons on copies from multiple libraries –personally collected– on a large scale. I set off to do so. My main goal originally was to look for any obvious anomalies. Second, the frequency of the two papers posting the birth announcements in exact order within a day or two of publication. Third, anything that jumped out as being out of place, or dissimilar between the copies from each location. I will begin with a very abbreviated history on the discovery of the infamous obama newspaper birth announcements, followed by my own experiences and the materials that I’ve collected which are relevant to the research in this post. So, basically this is written somewhat like a a journal. There are a total of four different posts, and a “supporting” page of PDF’s titled “The Wheat and the Chaff”. (over in the right hand column). Shortly after obama’s “COLB” appeared on his campaign website, many people claimed that it was fraudulent, and demanded that he produce his original long form BC. That never happened. Instead, an intrepid PUMA doing research made the discovery of the now famous obama birth announcement that apparently appeared in the Aug. 13,1961 Honolulu Advertiser. This was “discovered” by Lori Starfelt, who made the claim that she was sent the copy by the Hawaii State Library. BREAKING UPDATE: “LORI STARFELT” IS SAID TO HAVE PASSED AWAY. MARCH 16th 2011, FROM UTERINE CANCER. THERE WERE CONDOLENCES WRITTEN ON “HER” BLOG, AND A MEMORIAL DATE SET FOR ONE MONTH AFTER SHE PASSED AWAY. NO OBITUARIES, ETC. WERE FOUND. THIS FILMMAKER DIED THE DAY BEFORE DONALD TRUMP BEGAN HIS SUPPORT OF THOSE WHO QUESTION OBAMA’S ELIGIBILITY. “This announcement was not found by, as might be expected, the usual suspects (the “Obamania media” as they’re known by some), but by one researcher trying to prove that Obama wasn’t born in the U.S: Lori Starfelt, who’s part of a team creating an anti-Obama documentary for the pro-Clinton PUMAs. It was posted by “TexasDarlin,” another person researching this issue. I’ve got to hand it to these people. Even if their effort is only to going to lead to the conclusion that he is a citizen (which, with this announcement, would seem to be closer and closer to the case), they’re pretty good researchers. I think rooting out possible corruption and deception is not a bad thing. Or does it? One very notable thing going on in her “statement” is that she seems to have been able to effortlessly get answers that no one has been able to get since. If you try to get this info from the newspapers, the hospitals or from the Department of Health in HI, you will not get a straight answer. But Lori Starfelt got one. And, she actually got an almost PRISTINE copy of the announcement. Now, we don’t REALLY know where she obtained it from, she claimed that it was given to her by the Librarian at the State Library in Honolulu. This was the Aug. 14,1961 Honolulu Star Bulletin announcement-the one on the right above. Just click to enlarge. Now, you will notice that in this example (from a pro-obama google webcache) is the “same” ad as above, only it looks a bit different: No dotted lines, letters have been restored and do not appear “chopped off”, heavy line under Asing announcement missing, periods added to the “A M Hatchle” announcement”. Nice and shiny. 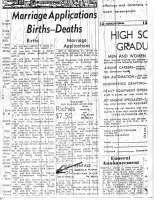 “The Advertiser and Star-Bulletin began collaborating on reporting birth announcements in 1961. On June 1, 1962, they signed a Formal Letter of Agreement to create the Hawaiian News Agency to jointly publish both papers, an agreement that remains in place even today. WHY DID I HIGHLIGHT THE STATEMENT IN THE WND ARTICLE? It has been advanced many, times that there is more weight to this “proof” because the announcements appeared in both papers one day apart, presumably because both papers are thought to have always published the same birth announcements. So, if it is in one paper it is in the other. That erroneous presumption was corrected early on by other researchers who found that identical listing of these announcements was not typically the case. I own a set of paper copies of both of these newspapers (copied from microfilm) that were personally collected for me by a close friend. The copies that I own are from both the Honolulu Advertiser and the Star Bulletin, and were collected from BOTH Hawaii libraries that have the micro films, the State Library and the University Library. These were collected early March 2010. I also own a set of these paper copies from the Library of Congress in Washington DC, that I personally collected in 2010. The dates for each set are from July 23,1961 through September 8, 1961. I wish to make it clear that I am not claiming to have the microfilm rolls-I have the paper copies made while viewing the microfilms. The viewer has a printer that allows you to print the image on the screen. LET ME MAKE A STATEMENT HERE. THE IMAGES OF THE ANNOUNCEMENTS FIRST POSTED (SHOWN ABOVE) DO NOT MATCH THE CONDITION OF THE COPIES THAT I OWN. IN FACT, THE COPIES THAT I HAVE FROM HAWAII ARE CLEARER AND HAVE LESS SIGNS OF WEAR IN THE STAR BULLETIN OF THE SAME DATE, SUPPOSEDLY FROM THE EXACT SAME LOCATION. But the Advertiser is definitely in much worse shape. It has damage marks that run both diagonally and horizontally. The diagonal marks are odd, the film only slides between two glass plates and is otherwise stationary. I looked into the history of microfilms and found out that these are very tough films, meant to last “99 years”. Where you see the dotted line above obama’s announ. in the first ever online posted image, on my copy of the Advertiser from the same location there are significant lines obscuring that area. Additionally, the bottom of the letters in”obama” are not cut off as they appear to be in the original image. The “a” at the end of obama appears slightly tilted and lower than the rest of that letters in that line. Clearly, one would NOT expect these microfilms to morph in precisely this way. I mean one gets better, one gets worse – by scratches appearing that cover an area that has repeatedly been pointedout as having a strange “dotted line” above the obama announ. The copies from the University Honolulu Advertiser are in excellent condition. Almost as clear as the Starfelt image. I will say straight out that the stories from both “Lori Starfelt” and “Koa” are misleading and in the case of “Koa” a complete lie. So, the stories of the first “discoveries” are actually complete fabrications. I do not know if Starfelt intentionally lied, but that copy she emailed to TexasDarlin could absolutely not have come from the source she claimed to have been told it had. And Koa outright made that story of his/her discovery up. The images from the copies we collected prove this beyond doubt. Additionally, Koa seemed to know nothing of the process of viewing the film on the reader-in fact had no idea about the dates on the film he/she supposedly handled in person. The films are on reels dated from the first of the month to the 15th., then from the 16th. to the last day of the month. The Honolulu Advertiser published both an am and pm edition each day. The boxes in the Library of Congress were in very good condition. The boxes of the Honolulu Adver. in both HI locations were quite worn, while the boxes for the Star Bulletin in both HI locations were in very good condition. The box containing the Aug. 1-15, 1961 Honolulu Star Bulletin in the Library of Congress in Washington DC. 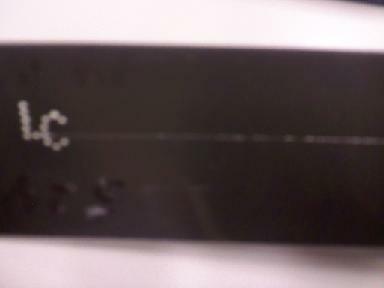 has the original reference numbers scribbled out and rewritten in black ink. (Taken with my cell phone) The Star Bulletin films were in boxes marked: Micro Photo Inc. 1700 Shaw Ave. Cleveland12, Ohio. The Honolulu Advertiser films were in a box marked: Recordak Corp. 444 Madison Ave. New York, NY. The Aug. 1 -15 1961 Star Bulletin microfilm at the Library of Congress has a slice down the center of the film, it begins at the identifying “LC” punch outs on the end of the film. Sorry, my photo of this is not very clear. The slice down the center is actually very straight and deep. I ran my fingernail across lightly and it caught up in the slice. UPDATE: I neglected to mention before that when I examined this film on site I did unroll it over a yard to determine how long the slice was. It was on the entire portion that I unrolled, and did appear to continue-I didn’t want to be too obvious, so I didn’t unroll it further than that off of the spool. At the University Library in Honolulu the staff delivers the film and also replaces it. You are not under any observation while handling the film. No library card needed. At the State Library in Honolulu you collect the film and return the film yourself. Other than some rude staff members making snide comments about my friend, and presumably to him, as he was able to hear said comments (having the leisure time to do so may be one reason that HI has the Library staff on furlough days) he was unsupervised while making copies. Copies at that library require inserting COINS into the viewer copy machine. No Library card needed. At the Library of Congress you must pass through security upon entering the Library. You must obtain a Library card. You must fill out a request form and the films are delivered to a table which you indicate on the form. You return the films to a special area yourself. You are unsupervised while making copies. You must have any purse or bag/backpack glanced into upon leaving at he main entrance, otherwise you do not go through “security” again. My friend felt it would be a very simple matter to make a switch of films in either HI Library. I can confirm the same would be the case even with the Library of Congress in spite of the “security” checks. OK, so now that we have all of that out of the way I will put up the PDFs containing images of the copies for Aug. 13, 1961 Honolulu Advertiser, and the Aug. 14, 1961 Star Bulletin that I have from the Library of Congress, both of the Hawaii Libraries. You can do the math yourself. These are kind of huge, so just adjust the size. Some are copied in sections so that the top of the page including date, page number, ect. are included. ADDITIONAL APOLOGIZES: I DON’T HAVE THESE IN THE FORMAT I WANT, I AM STILL WORKING THE BUGS OUT. SORRY THAT YOU HAVE TO CLICK ON PDFs! OBSERVATION: The PDFs for the Library of Congress-Honolulu Advertiser shows no “periods” after the A M Hatchie announcement (two below obama’s). At 400% blown-up there are no “periods”. In the copy from the HI University Library they are crystal clear at the size the PDF opens in. In the HI State Library Honolulu Advertiser, the periods appears to be there as well, though harder to make out. Since that is the most “degraded” of the microfilms, if those are visible there, they should be on the Library of Congress copy also. AND: in the first ever posting of the obama announcement-the last name is spelled Hatchle, NOW in every copy I’ve seen it appears as Hatchie. So, again-clear differences between the copies at different locations. All aspects of the text should be the same in all papers/microfilms. Here’s where I throw a monkey wrench into the wheels turning in your mind. I will post PDFs of these next images. See how quickly you pick up what you are looking at. This is page 23 from the Star Bulletin on Aug. 14, 1961. 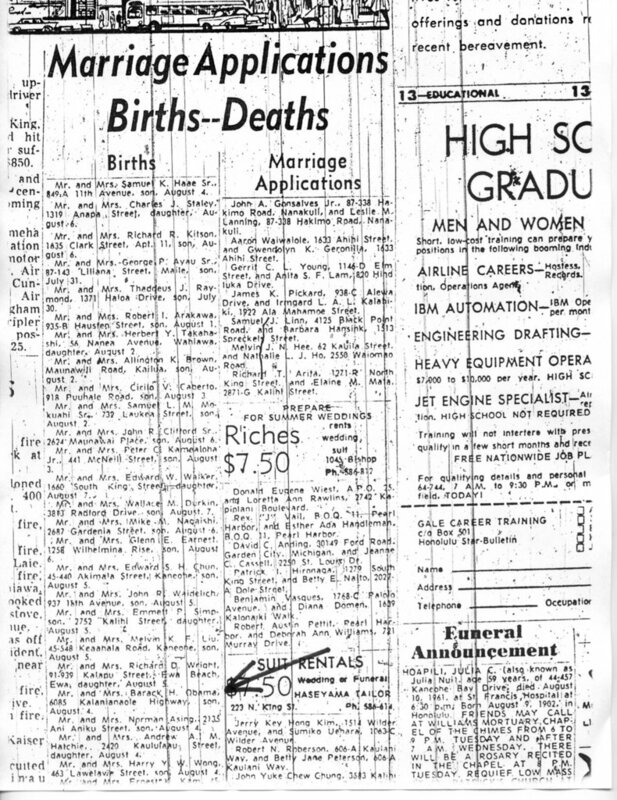 Tip: obama’s birth announcement appears on page 24, Aug. 14, 1961 in the Star Bulletin. YEP, you got it in one. The film shows that page 23 was imaged twice. What is most notable about this is that the same exact page was not imaged twice, but page 23 was laid out twice as you can clearly tell from the images in the copies. It is this way on the Library of Congress copy and the University Library in HI, I do not know if the film in the other HI library has the same occurrence because my friend did flub that copy….not sure he was looking at the instruction page that day. Sigh. Now, remember that this is the page that appears immediately before the page obama’s birth announcement is published on. Remember back when I highlighted this statement in the article from WND: A comparison of the Obama birth announcement in the two newspapers shows they are identical in every detail,including the order of other announcements preceding and following the Obama listing.“ ??? I will explain why I highlighted that snippet. It has been advanced that both papers printed identical lists as the general rule. As I mentioned before, this was pointed out to add more “weight” to the “proof ” these newspaper birth announcements lend to obama’s birth story. As it turns out it was done more or less sporadically. I pulled a sample size of ten days from each paper. I began the splendidly tedious process of comparing the incidence of the same birth announcements being listed in both papers. Mainly with an eye towards how often they matched in exact order.The only time this occurred in that particular way within the ten days that I researched, was on the dates that had obama’s birth announcements. And I even took the extra steps of comparing editions to a three day range (edition before, same date, edition after) of the sister publication. So, I tried to cover all the bases in a fair comparison. So. The ONE and ONLY time that the two papers published the birth list, beginning at the first announcement, in exact descending order, was the editions that obama’s birth announcement appeared in. This was indeed the only time that these announcements were printed this way, as the closest the papers came to doing this again never had all the same names listed in the exact same order. I figured the ten day sample would give conclusive data as to if this was uncommon. This also shows that the story Starfelt gave about how these announcements got to the newspapers was false. I eventually finished comparing the two month range of birth announcements that I have – nowhere did ALL of the announcements match the next days announcements in the sister paper as they did on the days where obama’s announcements are listed. I also checked the copies for Jan. 15 1961 – all of Feb. ’61, and the phenomenon did not occur during that time frame either. And I must mention, I didn’t forget the Nordyke twins birth announcement. Remember that it was given to this blog by a Citizen Investigator, and this is the first blog that published that image for public view. http://myveryownpointofview.wordpress.com/2010/01/07 While I was looking at my newest Library of Congress copy of the Aug. 16 1961 (the date the Nordyke twins announcement appears) I happened to notice that off to the side a few columns over was what looks to be a fingerprint. It’s in scale with the newspaper, not the viewer. It’s NOT in the copies from each location. The theory is that these came from a master reel-all of the microfilms. When a “fingerprint” is in one, it should be in all. Yes? Ponder this over: No one can access the Certification Of Live Birth (COLB) presented as proof of obama’s birth in HI. But they cannot restrict the public’s access to these microfilms. It is truly remarkable how these are morphing since first being discovered, allegedly, at the State Library in Honolulu HI, is it not? Special thanks to some wonderful and dedicated associates that have worked on this data as well. Big thanks to Redpill for spreading the word. The Network Of Knowledge. Dig it. Extra giant thank you to TsunamiGeno for his hard work on behalf of his old friend…me. I know how difficult this had to have been, boy do I ever! I WISH TO STATE THAT I AM NOT MAKING A CLAIM THAT I HAVE FACTUAL PROOF THESE MICROFILMS CONTAINING BIRTH ANNOUNCEMENTS FOR obama ARE TAMPERED WITH. I HAVE DISPLAYED ON THIS BLOG, OVER FOUR SEPARATE POSTS, A PORTION – THAT MOST DIRECTLY RELATING TO obama’s BIRTH ANNOUNCEMENTS – OF THE MATERIAL THAT I HAVE COLLECTED. I HAVE DIRECTLY SHARED COPIES AND PDF’S OF MY RESEARCH WITH OTHERS WHO ARE INTERESTED IN DOING THEIR OWN RESEARCH, THEIR CONCLUSIONS AND OR CLAIMS ARE HOWEVER, THEIR OWN. I DO NOT ENDORSE ANY CLAIMS MADE BY ANY OTHER PERSON/PERSONS IF THOSE “CLAIMS” ARE NOT INCLUDED IN MY OWN RESEARCH WORK PRESENTED IN THIS BLOG. Here is a link to a fairly recent article about the archives housed by the newspapers. ~ by ladysforest on May 28, 2010. This entry was posted on dimanche 15 mai 2011 at 7:30 and is filed under désinformation, Elections, hommages, médias. You can follow any responses to this entry through the RSS 2.0 feed. You can leave a response, or trackback from your own site. je n’ai rien compris à cet articles , tu peux résumer stp ? Une nouvelle preuve d’une naissance americaine d’obama s’avere etre en fait fausse ou peu fiable ?? ?